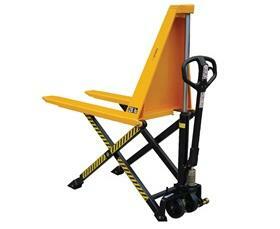 Lifts 2200 lbs up to 31" on reinforced forks that measure 3-1/2" lowered height. 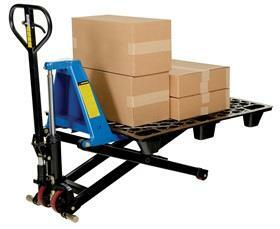 Polyurethane wheels and load rollers make movement easy. Steering wheels measure 6" x 2"; fork wheels measure 3" x 2". 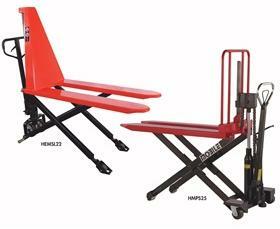 Two bottom rollers automatically brake to the floor when the forks reach a lifting height of 17". Handle features a 3 position-finger-tip control to raise, lower or neutral. <B>For use with single faced pallets or skids only.</B> FOB Shipping Point. 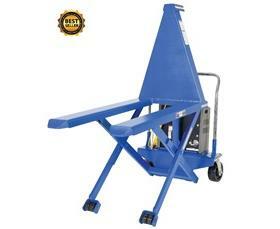 Ideal for work positioning stations. 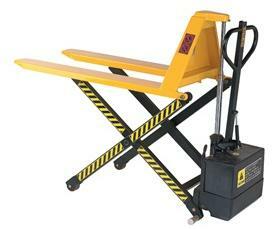 Smooth operating battery lifter makes short work of heavy loads. Easy one man operation saves time and effort. Rolls smoothly on polyurethane wheels. 180&deg; steering radius. 3.3" lowered height. Comfort coated handles. FOB Shipping Point. Rolls smoothly on moldon polyurethane wheels. 180&deg; steering arc. Closed pallets must be placed on top of forks. 3.6" lowered fork height. FOB Shipping Point. Two operations available -- Hand Pump and 12V DC Power with rocket switch to raise and lower. Hand Pump design features an ergonomic pump handle with 2 lifting speeds to accommodate for light or heavy loads. Suffix "SS" for stainless steel construction. FOB Shipping Point. 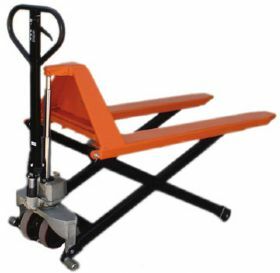 Heavy loads can be lifted by electric hydraulic power and manually moved without the use of a fork truck. 12V DC power with on-board battery charger standard. 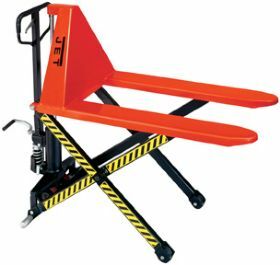 Heavy loads can be lifted by electric hydraulic power and manually moved until auto brake engages at approximately 8". Push buttons to raise and lower lift are located on power unit.&nbsp;Key-operated ON/OFF control for better security is built into the power units. FOB Shipping Point. Powerful two-stage hydraulic pump may be operated by steering handle or convenient foot pedal. 3" x 2" nylon load wheels and 7" x 2" poly over steel steer wheels. FOB Shipping Point.